An exotic, tall-dark-and-handsome visitor has returned to the Chicago Botanic Garden this spring. Its bold blooms draw pollinators in as well as Garden visitors. What is it, you ask? 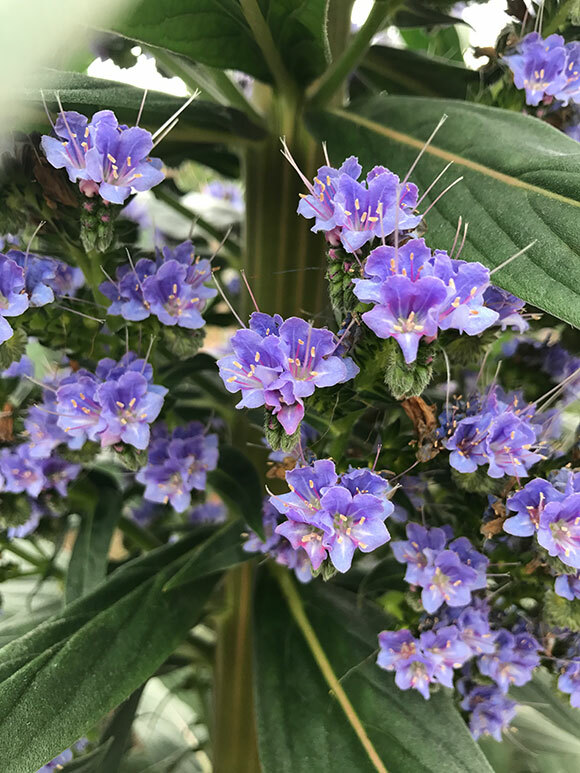 Some of the most unusual plants our Production Greenhouse team grow for our display gardens are six species of Echium, a biennial plant that produces giant spikes of flowers—but not right away. 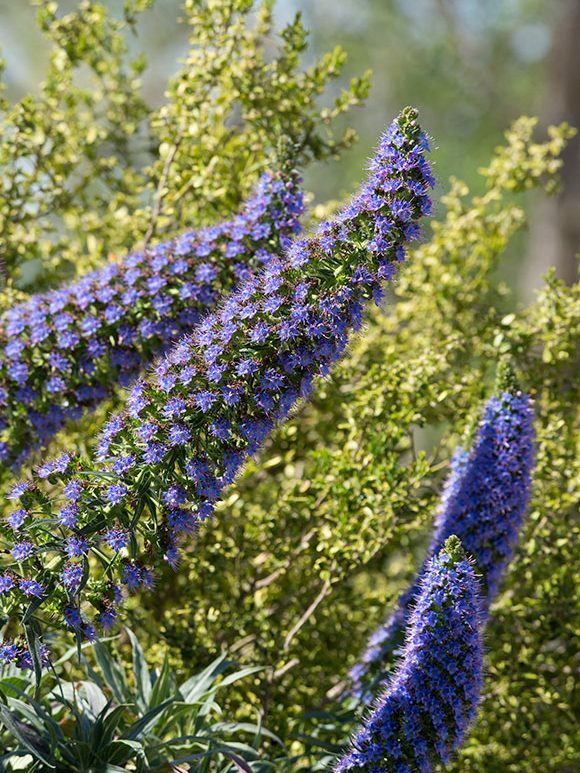 Echium take two years of growth to become the epic plants you see throughout the Garden. You won’t find these Dr. Seussian plants in many other gardens in the Midwest (if you do, please let us know). Echium are native to the Canary Islands, regions of the west coast of Africa, and southern Spain/Portugal. They are not hardy plants in Chicago, meaning they cannot withstand our winters outdoors. Growing them requires strict cultural practices to ensure their successful flowering. The team starts the plants from seed in November, transplanting seedlings into smaller pots to establish healthy root systems, before placing them in a cool greenhouse for the winter. The following spring, they are transplanted into their final growing container and moved outside. They are grown in a semi-shaded location and fertilized regularly all summer. In fall, they are moved into a protected nursery quonset, with temperatures of 42-45 degrees Fahrenheit all winter long. (It is called vernalization, and it is a process by which keeping a plant in colder winter temperatures induces a bloom cycle.) The Echium‘s second spring—about 20 months after sowing the seed—is usually mid-to-late March; they begin to set flower buds and elongate their flower spikes. 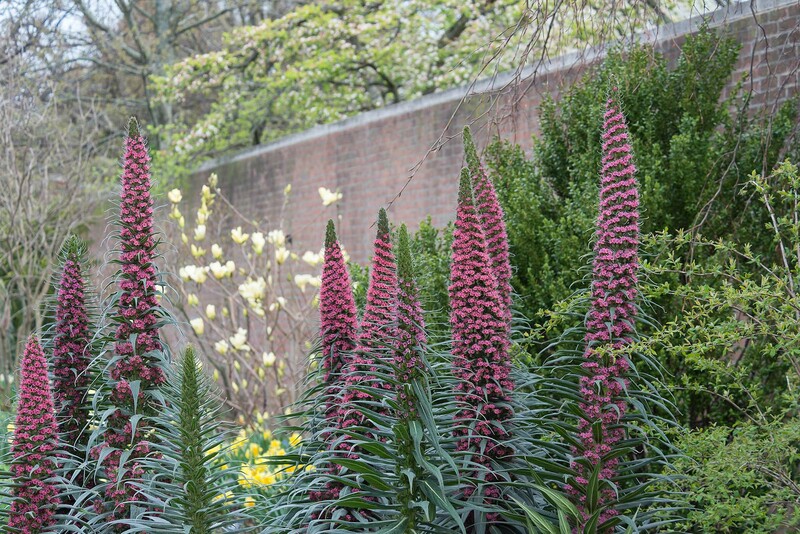 An assortment of colors of Echium fastuosum, or Pride of Madeira, is a focal point of the Heritage Garden this spring. You will find Echium growing in beds and containers outside the Visitor Center, in the Heritage Garden, and the English Walled Garden. These stars of the show are hard to miss! As you come across them, we hope you, like us, think of the team of skilled horticulturists who cultivate these “wows” each year—as well as nearly 70,000 spring annuals and vegetables. Learn more about these Echium on display in our Plantfinder. Visiting the Garden this morning and the Echium are fabulous!!! What a great plant–great growers and designers! 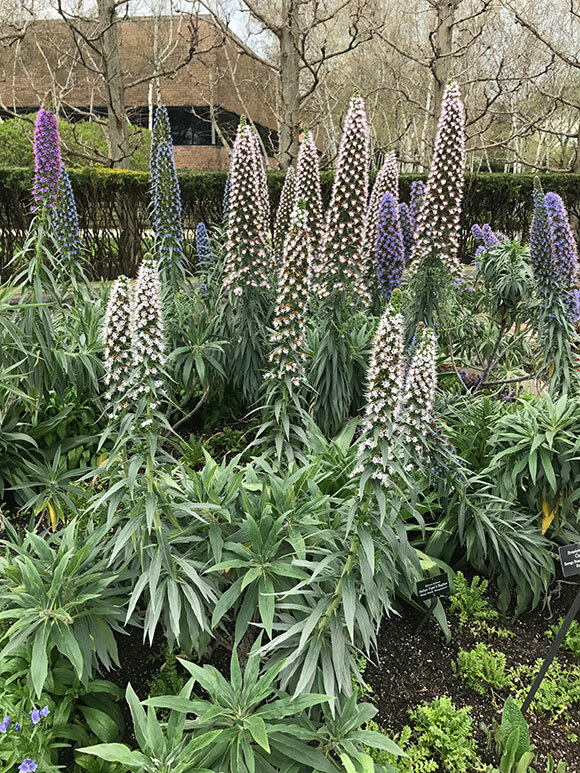 Are these pictures of your garden Echiums? Yes! These photos are all of Echium currently on display here at the Garden. I visited the garden last week and wondered about the “really tall spiked” plants. Thanks for educating my curiousity and enjoy your informative emails. Keep up the good work. Thank you for the background info on these plants. We always enjoy them and think of them as rpthe Dr Seuss flowers. They seem to grow so fast.